Delaware’s colleges and universities are bucking national trends and reporting record enrollment numbers, especially for non-traditional adult learners and international students. These are primary demographics for online learning, and more colleges in the state are opting-in to online education options, including hybrid programs and fully-online degrees and certificates. To learn more about what earning a degree online in Delaware looks like and find answers to frequently asked questions on paying for college, transfer credits and college preparation, continue reading below. How Much More Do College Grads in Delaware Make? University of Delaware is one of the nation's top research institutions that touts its focus on "discovery-based learning, applied research and dynamic skill building" that students can benefit from in their online courses. Undergraduates wishing to complete the first half of their bachelor's degree online can earn an associate's degree or licensed registered nurses can earn a bachelor's in nursing. Graduate students can earn a Doctor of Nursing Practice or a master's in over 10 programs including their featured programs in business administration, science in cybersecurity, public administration and international business. Wilmington University has a huge offering of more than 125 programs , concentrations and certificates that are 100% online, with the same quality as in-person programs but with more flexibility. Through its College of Online and Experiential Learning, Wilmington provides opportunities for students to gain credit for prior learning (such as military training), have access to experiential learning options and help define online education pathways to success. Undergraduates have degree options such as behavior science, business, communications and criminal justice, and graduates can pursue online master's and doctoral programs in accounting, cybersecurity, business administration, education and nursing. Delaware State University is a highly respected HBCU (Historically Black College and University) that has a targeted offering of bachelor's and master's degree programs. Undergraduates have 5 degree options (criminal justice, psychology, public health, accounting and general management) and graduate students have 4 degree options (business administration, public administration, social work and sport administration. Master's programs can be completed in as few as 12 months for full-time students, but can be taken at a slower pace for busy, working students, over a period of up to 2 years. How Can I Find Which Online Colleges Offer the Degree I’m Looking for in Delaware? Online schools in Delaware offer a number of degrees, easily searchable through the Delaware Department of Education’s website. The department provides a comprehensive list of the state’s institutes of higher learning. College programs continually undergo changes, so students should contact their schools of interest directly for the most current information. Many institutions also provide a list of their distance learning program selections online. The University of Delaware is known for having 200 individual online courses, which is great for students undecided on their majors. Along with associate and bachelor’s programs, the university offers several online master’s programs as well as a doctoral program. Which online schools in Delaware will accept my transfer credits or work/life experience? Every online college and university in Delaware has a transfer policy in place; however, not every class can be transferred. The University of Delaware makes it easy for students to find out if transfer credits are accepted through their Transfer Matrix. Delaware Technical Community College also offers a searchable database that shows which classes may be transferred from local and regional colleges. Furthermore, the Wilmington University College of Online and Experiential Learning gives students credit for previous learning or life experience, including military service. Obtaining a college degree may increase your earning potential, and the U.S. Bureau of Labor Statistics affirms this. Let’s take a peek at how much professionals in Delaware earn as their education level increases. The discrepancy in the overall rise in salary in Delaware correlates with a lack of jobs for professionals who hold a master’s degree, according to the Bureau. Still, Delaware residents who claim jobs requiring a doctoral degree make upwards of $80,000 more annually than peers who did not complete formal education programs. In Delaware, traditional pillar industries—automotive and manufacturing—no longer generate enough jobs for the burgeoning population. To accommodate a growingly college-educated populace, Delaware emphasizes building an innovative and entrepreneurial economy. Increased financial services, knowledge creation and education and business services are part of the push to develop a future-oriented Delaware economy. Quality standards do not have to be forfeited when students consider earning an online education in Delaware. Whether taking classes online or on-campus, accredited colleges and universities are required to provide the same, high-quality curriculum and standards across the board. Accreditation is important because it ensures a college or university is consistently meeting quality standards year after year. Delaware’s regional accrediting agency is the Middle States Commission on Higher Education. The MSCHE also regulates schools in New York, Pennsylvania, the District of Columbia, Maryland, and New Jersey, among others. Many universities publish their accreditation status on their website for easy access to prospective students. 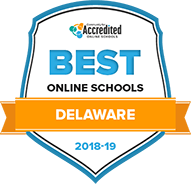 In addition to regional accreditation, leading online schools in Delaware may also hold subject-specific accreditation. Wilmington University has received accreditation for its business school from the International Assembly for Collegiate Business Education—Wilmington offers a bachelor’s degree in business management online. Students in Delaware may feel concerned about the increasing cost of a college education. Despite increasing costs, Delaware remains steadfast in offering a variety of financial aid tools for prospective students located both in-state and out-of-state. Online colleges in Delaware often charge the same tuition rate for in-state and out-of-state students. At the University of Delaware, both out-of-state and in-state students pay the same tuition for online graduate school, and both undergraduate and graduate online students pay the same tuition at Wilmington University. Keep in mind, part-time students may pay a different rate than full-time students, such as these per-credit rates published by Delaware State University. Delaware residents can also take advantage of tuition savings through two programs offered by the Southern Regional Education Board: the Regional Contract Program and the Academic Common Market. Students completing their studies in the professional health field, such as dentistry or medicine, can pay in-state tuition at Delaware universities thanks to the Regional Contract Program. The Academic Common Market provides students with in-state tuition rates for over 1,900 graduate and undergraduate programs across the U.S., including programs in Delaware. Check out some of the most commonly asked questions about Delaware’s online college costs below. What are Delaware’s requirements to qualify for in-state university tuition? In a majority of cases, students are eligible for in-state college tuition if they establish residency for at least one year prior to the first day of school. If you enroll in an online program, you may already receive the same tuition rate as in-state students. Are online credits more affordable in Delaware Than Other Places? It depends on where you decide to attend, but even some of the most expensive colleges in Delaware charge less for online tuition than the average United States total tuition cost. Delaware State University charges around $7,800 and $16,900 for tuition and fees for in-state students and out-of-state students respectively, and the University of Delaware prices their tuition at $13,000 for in-state and $33,000 annually for out-of-state students. However, if you are a student from outside Delaware interested in earning an online degree from a Delaware school, be sure to check state authorizations at your school of choice to ensure degrees and credits will be properly honored and awarded. How Can I Get Help Paying for Online College in Delaware? In addition to receiving help in the form of federal financial aid (FAFSA, Pell Grants, etc.) students should explore local and state-specific scholarship opportunities. Here are a a few scholarships set up specifically for students in Delaware. Atlantic Amateur Hockey Association Scholarship: Available to any high school senior in Delaware who registered with USA Hockey, Atlantic awards $1,000 for furthering education. Better Business Bureau Foundation of Delaware: This $2,500 scholarship is available to any college-bound senior who has personified ethics through their academic history and community service. Diamond State Scholarship: This scholarship offers financial assistance to Delaware residents who ranked in the upper 25 percent of their graduating class; earned a combined 1290 SAT score; and enrolled in a nonprofit, regionally accredited university. The $1,250 scholarship may be renewed for three years if the student recipient maintains a 3.0 GPA. For more information on scholarships related to your particular demographic, hobbies and extra-curriculars, browse our complete scholarship library. College may seem out of reach for people with job and family obligations or past academic struggles, but earning a college degree online is more attainable for non-traditional students, military veterans and underserved populations thanks to Delaware’s adult education programs. These programs can help prepare adult students both academically and technically for college, acting as a stepping stone to higher education. Adult Basic Education and GED Classes Being academically prepared for college in Delaware may mean brushing up on and math, writing and English skills or earning a GED, which Delaware’s adult basic education classes cover. English as a Second Language The State of Delaware provides ESL programs that can help aspiring college students prepare to earn their online degree. Training, Internships and Apprenticeships As Delaware students work towards a degree, programs like Wilmington Works connect college students to internship opportunities to help gain job experience before graduation. Continuing Professional Development Whether earning a new certification or building advanced technical skills, adult education programs in Delaware provide a variety of ongoing learning opportunities for students after college. In Delaware, adult education programs serve men and women fairly equally, and most people who participate fall between the ages of 25 and 44. Between July 2016 and June 2017, nearly 4,000 people in Delaware participated in adult education programs.